I have been intrigued with the Scaccomatto chess set since I stumbled across an ad going through old newspapers. They almost never come on the market and when they do they are terribly expensive. A set was offered in 2016 for $13,000. A set was previously offered in 2010 for $1,600. 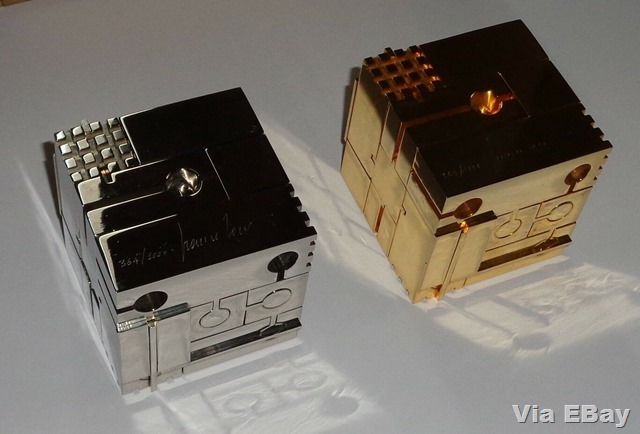 In the design by Franco Rocco, the pieces fit together into two metal cubes. The chess set is listed as “Buy It Now” for $6,500. As with anything sold on EBay, a prospective buyer should investigate an item and vendor thoroughly before submitting a bid. This entry was posted in 1977, Found on EBay and tagged chess set. 1977, Franco Rocco, Scaccomatto. Bookmark the permalink.